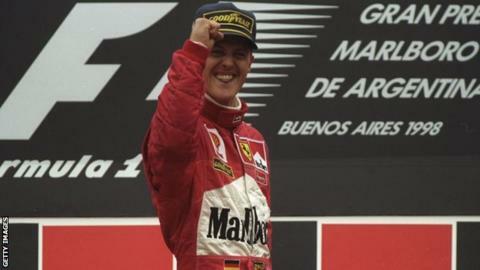 Argentina could return to the Formula 1 calendar, according to chief executive Bernie Ecclestone. The country last hosted a race in Buenos Aires in 1998, but Ecclestone said of a return: "It can happen. Not will, can." Latin America currently holds two grands prix, in Brazil and Mexico, which returns for the first time in 23 years this weekend. Organisers are expecting a crowd of more than 100,000 for Sunday's race. "It's incredible. All these countries in a little bit of financial problems are getting the job done," said Ecclestone. "This is when some of our people in Europe, who complain about things, realise what people like these do to promote the race and make it happen and compare it with what they do." Many of the countries new to the F1 calendar in recent years - Bahrain, China, the United Arab Emirates, Russia and Mexico, and Azerbaijan next year - benefit from significant state funding. European government cannot as easily justify the race fees, which are in the region of $40-50m (£26-32m) a year for some of the newer races. Some, such as Britain, raise their fees, which are smaller but still generally at least $20m (£13) a year, from private means. Germany was absent this year for financial reasons, despite it being the home of Mercedes, while Italy's Monza circuit has yet to agree a contract beyond 2016. Ecclestone, who met Mexico president Enrique Peña Nieto at the Circuit Hermanos Rodriguez in Mexico City on Thursday, said the country's place on the calendar was assured for the time being. "It was long term before and it will be long term again," said Ecclestone. The track hosted a race from 1986-92, before dropping off the calendar. Ecclestone praised the efforts to promote the return of the race made in Mexico, where publicity is focusing on Force India driver Sergio Perez, a native of Guadalajara.